The FIRST EVER Reverse Proof High Relief Silver Wedge-Tailed Eagle! A few years ago, we brought together John Mercanti and the Perth Mint to collaborate on a new coin series. Little did we know that we'd help start an international sensation! This match of the most prolific designer in United States Mint history along with the heralded Australian mint produced the first-ever Wedge-Tailed Eagle in 2014-- the first time a U.S. Mint chief engraver has designed a coin struck by another official world mint. Now in its fourth year, the Australia Wedge-Tail Eagle series is still surprising collectors with this massive five-ounce high relief Silver Wedge-Tailed Eagle, minted with a reverse proof finish for the first time EVER! BREATHTAKING DETAILED ARTISTRY -- Each reverse proof features John Mercanti's design of Australia's largest eagle, perched on a lone tree branch in a majestic and vigilant pose. STUNNING HIGH RELIEF WITH A REVERSE PROOF FINISH -- Each coin begins as a hand-selected five-ounce planchet of highly-pure 99.99% fine silver. Then, using polished dies and multiple strikes, the artisans at the Perth Mint use state-of-the-art technology to create brilliantly mirrored details that rise sharply from a frosted field -- an expertly crafted reversal of traditional proof finishes. LEGAL TENDER -- Each reverse proof is legal tender eight dollars Australian. All the details are engraved on the obverse along with Ian Rank-Broadley's profile of Her Majesty Queen Elizabeth II. 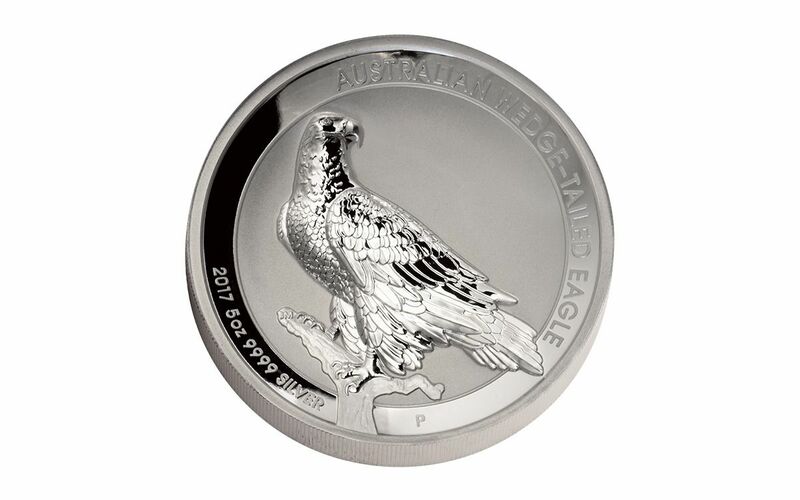 The coin's silver content, the year 2017 and the "P" mintmark join the wedge-tailed eagle on the reverse. PRESENTED IN PERTH MINT PACKAGING -- Your 2017 5-oz Silver Wedge-Tailed Eagle High Relief Reverse Proof will arrive to you in a Perth Mint-branded presentation case along with a numbered certificate of authenticity and story card. 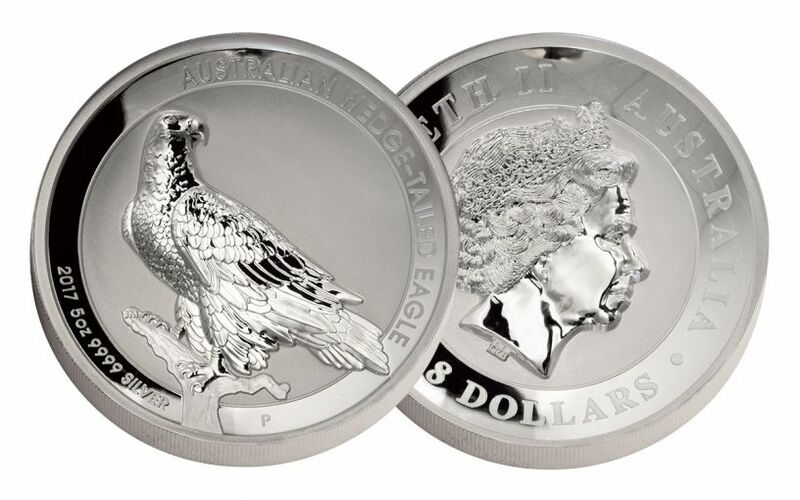 A LIMITED MINTAGE DEBUT -- The production of this first-ever high relief AND reverse proof Silver Wedge-Tailed Eagle is limited to only 2,000 pieces! That's right - that's only 2,500 reverse proofs for collectors around the world! 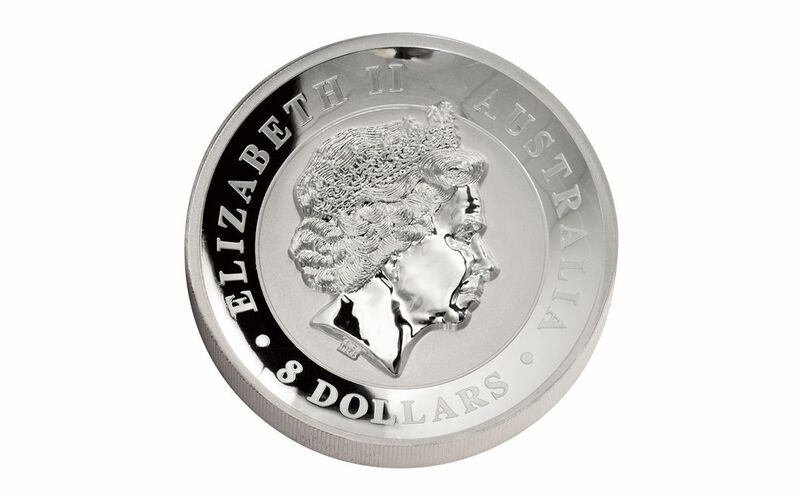 And, unless you live in Australia, your only source for this phenomenal silver coin is GovMint.com. The entire Wedge-Tailed Eagle series has been a global hit since 2014. And, with this first-ever entry, we're expecting these reverse proofs to soar out of our vaults. Don't wait another moment -- add this 2017 5-oz Silver Wedge-Tailed Eagle High Relief Reverse Proof to your collection today!